Fire crews have rescued a second person from the same stretch of the A47 in Peterborough in less than 24 hours. Crews from Stanground, Dogsthorpe, Thorney and the rescue vehicle from Dogsthorpe were called to a crash involving a light goods vehicle on the A47 near Thorney at 1.44am this morning (Tuesday, October 16). Crews worked with ambulance crews to release one man who was then taken to Peterborough City Hospital. Firefighters had also rescued a man from a van on the A47 near Thorney at around 7.30am yesterday morning. Crews had arrived to find the van had left the road and was in a nearby field. The ambulance service took the released man to hospital. 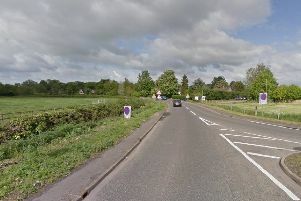 The Peterborough Telegraph has previously revealed that over four months from the start of May to the end of August this year, there was on average a road collision nearly every five days on the A47 from Thorney through Guyhirn. Senior politicians in the county have called on the entirety of the A47 to be dualled due to safety concerns, while local councillors have demanded action due to the number of vehicles being diverted through the villages following each collision. Meanwhile, fire crews were also called at 12.17am this morning to Gull Drove in Guyhirn. The crews arrived to find a vehicle had veered off the road and ended up in a ditch. Firefighters used specialist equipment to stabilise the vehicle and release one casualty, who was left in the care of the ambulance service. All crews had returned to their stations by 1.50am.